Last night, HTC unveiled their newest flagship in Taiwan, dubbed the Butterfly S. The device is every bit as good on paper as the HTC One, but one could argue that it’s an even better phone thanks to additions in some key areas. Keep in mind that the device will likely never reach our shores, at least as the Butterfly S. You never know if we’ll see it re-branded as something else though, just like we saw last year with the J Butterfly blossoming into the DROID DNA on Verizon. 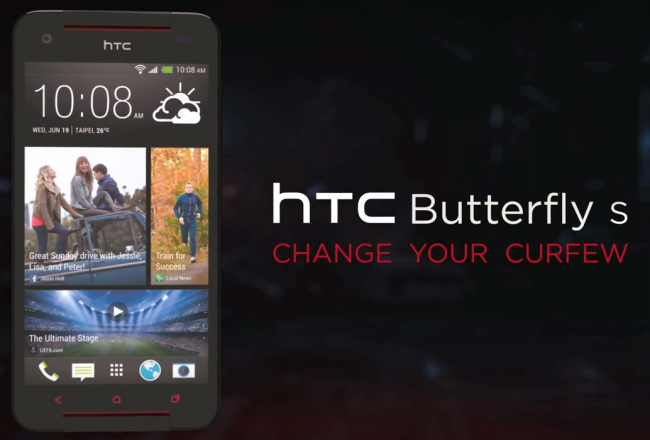 The HTC Butterfly S sports a Qualcomm Snapdragon 600 clocked at 1.9GHz, 5-inch FHD LCD 3 display, 3200mAh battery, UltraPixel camera, BoomSound front facing speakers, 16GB internal storage, microSD slot for expansion, Sense 5.0, and Android 4.2.2 out of the box. So from that list, we can see that it has a much larger battery over the One (2300mAh), has expandable storage thanks to a microSD slot, and already runs Android 4.2.2. Oh, we forgot to mention that it doesn’t carry the terrible Home-Back button combo for navigation like the One. The Butterfly uses last year’s button setup of Home-Back-Multi-task, a much more traditional Android setup. So last year, we saw the J Butterfly arrive in the U.S. as the DROID DNA on Verizon. A few months ago, we were starting to think something similar would happen again this year, however, Verizon has already announced that they will carry the HTC One at some point this summer. There is certainly a chance that they sell the Butterfly S and brand it as the One, but that seems sort of unlikely and odd. No, we’re probably stuck with the One that has been out for months already, and has lost some of its luster. No matter what, HTC’s new Butterfly S, which comes in three colors, looks like an amazing device. Taipei, Taiwan (AD June 19, 2013) – China Telecom (China Telecom Co., Ltd., hereinafter referred to as “China Telecom”) and the global leader in mobile phone innovation and design HTC (High Tech Computer Corporation, hereinafter referred to as “HTC” ) today (19) days to launch a large-capacity battery with the life of the HTC Butterfly s Great Leap Forward and the ultra-popular high-quality choice for HTC Desire 600 two products, the use of Android Jelly Bean operating system and equipped with HTC Sense ®, has a smooth and unique use of speed powerful features, providing consumers with diversified choices. HTC Butterfly s equipped with Qualcomm ® Snapdragon ™ 600 1.9 GHz quad-core processor with multi-tasking high performance, and is equipped with Full HD 1080p 5-inch high-definition screen; built-in 3,200 mAh large capacity battery, show the most excellent endurance. And also introduced three color styles, including: sports car with colored Teshi gray, pure pearl white with elegant ruby red, the HTC Butterfly s build for the high-fashion Yiping. our consumers HTC BlinkFeed home communities and media information can be integrated, global news immediately grasp, let you easily become information between peers guide. HTC Butterfly s combination of HTC Zoe Reality album with HTC UltraPixel camera, breaking the traditional picture thinking, retained vivid memories of the exclusive; taking pictures and also record a 3 seconds video, can be ” Continuous synthesis “,” best face “,” object removal “and other wonderful features, more possibilities to create pictures. Video Highlights living micro film also provides 12 kinds of rich themes, diversity of choice for consumers. more spot to make sound effects, equipped with dual front stereo speakers, allowing users to enjoy audio and video entertainment can feel when the left and right channels of the sound field effect culvert rich, built-in Beats Audio ™ sound reduction recordings room high quality, shake the user’s auditory nerve. could not find the remote control is a common scenario for each family, HTC Sense TV phone combines the power button infrared remote control function, easy to set up a few steps to be able to remote control TVs, set-top boxes and home theater, mobile phones become the interactive TV channel list, intuitive to launch TV viewing. is HTC Desire HTC Desire 600 new members of the classic series, powered by Qualcomm Snapdragon 200 1.2 GHz quad-core processor and 4.5 inch super LCD2 screen to bring consumers smooth operation and comfort visual experience. In order to better meet consumer demand for color, HTC Desire 600 will launch the film black and white two classic colors condenser, a symbol of understated black film character, the rich heritage of the film-coated black solid li; condenser white in dual stereo speaker and lens peripheral decorate red color, let the phone overall color is more shine, so that everyone can choose the most personalized colors. HTC Desire 600 In addition to having HTC BlinkFeed home , but also offer popular Video Highlights living micro-film, will shoot videos and photos into the essence of the permanent collection. Use 8 megapixel camera, you can automatically generate 30 seconds brilliant movie clips, built six kinds of special effects and rich in theme and moving soundtrack, with HTC BoomSound stereo viewing, allowing superb sound rich emotional memory. to the perfect HTC Butterfly s meticulous fashion design and exquisite excellent excellent performance level of the smartphone market fully raised, showing a new style; HTC Desire 600 has a smooth processing speed as well as unique features for creative, completely tailored for mobile life science and technology, both fully humanized HTC Sense user experience, with China Telecom’s mobile Internet quality and stable environment and a rich and diverse Canadian value-added services, combining mobile technology and life applications, allowing users to experience the unprecedented action of the top intellectual life. While Chunghwa Telecom Hami unique value-added services, including Hami Music, Hami Bookstore, Hami software shops, etc., but also combined with HTC BlinkFeed Homefeatures first-hand information and special offers will give users real-time, allowing consumers to keep abreast of China Telecom a full range of value-added services and upcoming events special offers, Hami value-added services combined with the powerful HTC hardware performance for consumers to create a wonderful life and facilitate rich mobile entertainment experience with the best. HTC Butterfly s suggested retail price of NT $ 22,900 million alone, HTC Desire 600 suggested retail price of NT $ 12,900 million stand-alone, two new machines are expected in July in full Province, China Telecom outlets and distribution outlets HTC Sync on sale, so that mobile technology and intellectual life more quality services. China Telecom Co., Ltd. in the Republic 1 July 1996 by the then DGT operating divisions established restructuring, the main business covers wireline communications, mobile communications, as well as three major areas of data communications, providing voice service, leased circuit , Internet, broadband access, intelligent networks, virtual networks, e-commerce, enterprise integration services, and a variety of value-added services, the Department of the domestic operations of the most experienced and largest integrated telecommunication’s also international carriers important partner in promoting globalization instant messaging communication, and comprehensively improve the quality of life of the community, as well as a general increase in economic and social operational efficiency, performance is outstanding. For more information, please refer to Chunghwa Telecom website www.cht.com.tw . HTC was founded in 1997, is the mobile communications industry in award-winning innovation leader for sure. By putting people at the center of the business philosophy, HTC constantly breaking both design and technology, the introduction of innovative products and personalized experience to meet the needs of consumers worldwide. HTC’s product portfolio includes smartphones and tablet PCs, equipped with HTC Sense ™ user interface rich and vivid, greatly enhance the user experience. HTC Corporation is listed on the Taiwan Stock Exchange under ticker 2498.Additional information about HTC, please refer to HTC corporate website www.htc.com . Augmented Reality DROID Contest "D:COM" Starting Soon, and Droid Life is Involved as One of the Warrior Robots?